As your baby begins taking her first steps, you’ll find it’s almost impossible to avoid bumps and bruises. Her steps will be shaky, but with practice she’ll begin finding the balance and strength she needs to move from the wobbly steps to being quite a confident walker. During this time, you might hear a baby walker can help her learn and prevent stumbles and falls. This is not true. Contrary to what the name suggests, the baby walker does not help your baby learn the process of walking. In fact, it eliminates the desire of walking altogether. Why? The baby walker will take away important floor time your child needs to strengthen her muscles, work on her coordination skills, as well as developing pelvis and shoulder weight bearing while being on a crawling position. Using a baby walker allows babies to move before their body is ready for it, causing delayed muscle control, unusual patterns, and difficulty in the perception of an object’s distance. 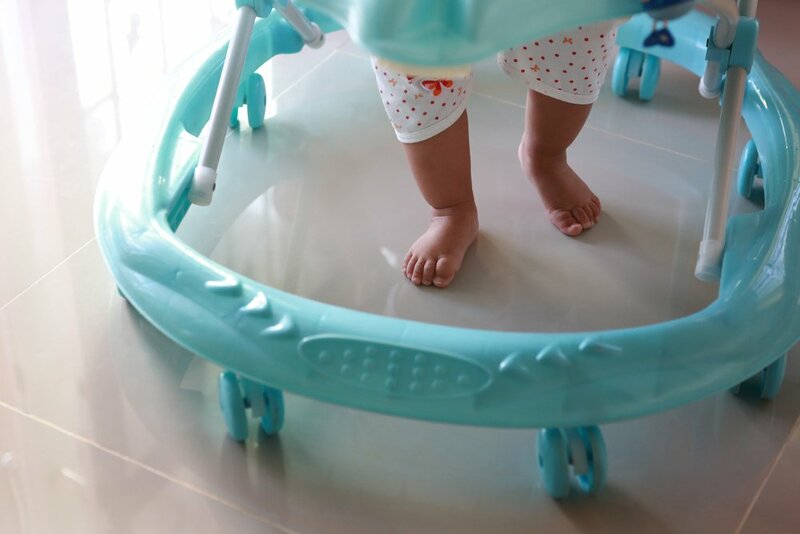 When using a baby walker, babies tend to use their toes to move, this causes tightness in their legs and interferes with the developmental process of walking. Baby walkers skip the important milestone of how babies learn to pull themselves up. This prevents them from fostering the balance they need for developing proper walking skills and future running skills. The American Academy of Pediatrics (AAP) strongly urges parents not to use baby walkers. In fact, the AAP has called for a ban on the manufacturing and sale of infant walkers in the U.S. Not only do they intervene with the proper process of walking, but they are also considered a safety hazard. A baby can move more than 3 feet per 1 second, which makes it very hard, even with an adult close by, to prevent a fall. Potential dangers include: rolling down the stairs, falling into a pool or bathtub, reaching higher for dangerous objects or hot drinks, and tipping over easily when the child bumps into an obstacle, such as a small toy or a rug. A study published in Pediatrics (2018) found that, from 1990 through 2014, more than 230,000 children under 15 months old were treated in U.S. emergency departments for injuries related to baby walkers. Even with the safety standards for baby walkers that have been in place since 1997, these improvements have not prevented all injuries. Walkers still have wheels, so children can still move fast and reach higher. The AAP states there are no benefits to baby walkers, and they can actually delay the developing of walking abilities. Try a stationary activity center. They look like walkers, but they do not have wheels. Offer a sturdy wagon or a “kiddie push car”. Just be sure the toy has a bar she can push and that it’s weighted so it won’t tip over when she pulls herself up on it. Yards are a great safe zone for children that allows them to practice crawling, sitting, pulling themselves up, and cruising around. A great variety of important movements are needed when your little one is developing her walking skills, but she’ll get fewer chances to practice these in a walker, as opposed to the floor. As your baby learns to walk with your help, she’ll improve her shaky sense of balance. During those weeks, she’ll may move too fast, so be sure you are near to help her through this, as she’ll occasionally want to reach for your support when she feels herself loosing balance. Your patience, loving support, and practice will help her become more confident as she learns how to stop and change directions. Before you know it, she’ll be able to squat down and then stand up again.